It’s a great week for comics and with all the exciting releases, there’s no reason not to jump right into them. 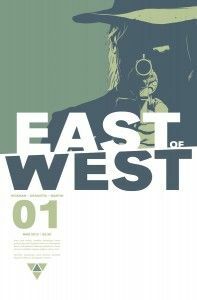 So, first up, East of West #1! East of West is the next creator-owned property from Jonathan Hickman. Nick Dragotta provides the art for this story set in a futuristic alternate history. The American Civil War went a very different way and this led to an altered map of America and a unrecognizable future. There are future apocalypses, children as harbingers of doom, Old West meets sci-fi, fights, murders, and revenge scattered throughout the pages of this issue. There’s a prophecy of doom and the death of several men as the the future of the United States is forever changed. At least two, possibly three, different time periods are presented throughout the course of the book as the story jumps around. For new readers, work up to this. This comic is cool, no doubt. I really enjoy it. But a new reader to comics will likely be lost. Hickman’s style of seeding bits of story throughout and slowly wrapping up the pieces could be irritating to some. Nick Dragotta’s art is completely solid and a great fit for the story. Parental Concern: Considerable. Blood, violence, language. The nephew of the Lone Ranger wages his own war on crime in the page of The Green Hornet. Mark Waid writes while Daniel Indro draws this story. Britt Reid publishes newspaper and exposes corruption by day while he masquerades as the Green Hornet by night. Waid gives a great introduction to the character, even touching on the often forgotten Lone Ranger connection. It’s a pretty standard introductory issue but sets up a great dynamic for the series. 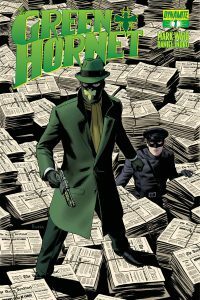 The idea of the Green Hornet posing as a criminal to get information is a cool concept. Indro’s art gives a pulp feel to the story, which is right in line with the character and comic. For new readers, this is great. It delivers a great basis for the characters and gives a great story to start off in. The story of the first issue is pretty well self-contained but seems to lead into the next big conflict. All in all, it’s a solid issue, but it’s expected from people such as Waid. Do yourself a favor and pick it up. Parental Concern: Minimal. Some violence. 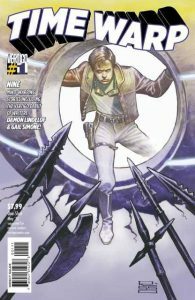 Time Warp is an anthology featuring time-travel centric stories from some of the top creators over at DC Comics. With names like Jeff Lemire, Gail Simone, Matt Kindt, I.N.J. Culbard, Dan Abnett, Damon Lindelof and more, it’s easy to imagine the quality of the stories contained within. Time Warp is a scifi anthology full of time travel stories. Everything from being eaten by dinosaurs to saving Hitler’s life to a story about Hitler’s sister. It’s a hefty volume full of interesting stories from true masters of the craft. The tales range in scope, but they all offer an interesting read. The time travel theme of the anthology is a cool topic and generates some fantastic stories. For new readers, something like this might be perfect. It’s almost just like a short story collection, in print books. The eclectic mix of creators and the central theme helps tie the stories together, but keep it all from feeling like the same thing. The fact that’s it’s a completely self-contained collection makes it a great first read for new readers. Pick this up, people! Parental Concern: Minimal to moderate. Some stories are clean, some involve blood and gore. 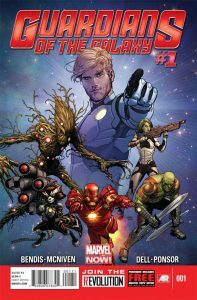 Brian Michael Bendis and Steve McNiven bring us the first full issue of the new Guardians of the Galaxy.Peter “Star Lord” Quill and the rest of his team go on their first new adventure as part of Marvel NOW and it’s an issue full of action, intrigue, a plot on a galactic scale. Peter starts the issue hitting on alien women in a bar before he’s approached by his father, King of Spartax. Peter’s father warns him that Earth is off-limits, and that Peter should stay away. Being a bit stubborn, Peter refuses to listen, prompting an encounter with a Badoon warship and the discovery that Earth may be in bigger trouble than originally thought. It’s a pretty good first issue, all told. It introduces all the characters, gives some back story, and sets up a good conflict for the first arc. Star Lord’s character is the typical hero with a chip on his shoulder, but Bendis’ writing makes it fun. Rocket Raccoon, as a raccoon with a rocket launcher, steals the show, but that’s to be expected. New readers can get into this likely unfamiliar team book on the ground floor, and it’s a fun read.